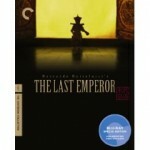 My Blu-ray pick of the week has got to be The Last Emperor. The film won 9 Academy Awards in 1987, including Best Picture and Best Director (Bernardo Bertolucci). The film tells the story of the life of Chinese Emperor Pu Yi, who took the throne at age three in 1908 and witnessed decades of political upheaval. The Last Emperor was originally released in theaters by Columbia, but after a few change of hands has been picked up by The Criterion Collection. Criterion released a 4-disc DVD set back in February of 2008, and has now released the hi-def version. The Blu-ray Disc version of the film is formatted in MPEG-4 AVC at 1080p with a super wide aspect ratio of 2.00:1. Audio is DTS-HD Master Audio 5.1 Surround. Total length of the film is 165 minutes.